There are many ways to get around Milwaukee International Airport but with a little help from our maps could help make your visit a little easier. Home to an old-fashioned way of entertaining, Milwaukee is a great place to either vacation or transition to the next one. If you’re lucky enough to see Lake Michigan while you’re in town, you’ll be able to say you’ve seen the largest lake in North America. If not, you can at least say you tried the local flavors and saw the kindness of natives, something constantly seeping out of the walls at General Mitchell International Airport. Reserve some time for your vehicle, saving yourself stress and money in the process. The airport has five main parking areas, one of which is a large Parking Garage that’s home to Hourly an Daily rates - the Garage is best for a few hours or 1-2 days of parking. If you’re planning on staying longer, utilize the nearby Daily Surface Lot, located south of the garage and offering almost half the daily price of the garage. 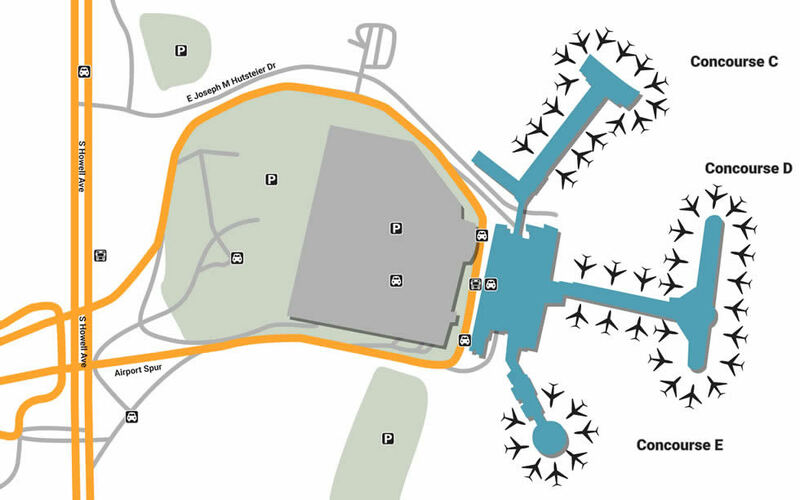 If you’re planning to pick up or drop-off a friend, park for up to 30 minutes at the Cell Phone Waiting Area, located within the Daily Surface Lot. Extra long-term travelers should go to the SuperSaver Lot, located a few minutes west of the airport and offering free shuttles to the Main Terminal every 10 minutes. MKE Airport is accommodating to all classes of people, from necessities for the disabled to relaxing scenery that anyone can enjoy. For busy moms, there are Mamava Lactation Suites located near Gates C9 & D36, not to mention two separate play areas, one across from the Chili’s in Concourse C and another beside Gate D30. The facility also offers low-cost Wi-Fi, the first 20 minutes provided free of charge. If you don’t feel like unwinding on the internet, go for a calming walk through the Gallery of Flight Museum, an on-site facility that explores the history of aviation. Many don’t see shopping as a necessity, but when you find yourself missing someone, the act of gift-giving is priceless. Pick up something stylish in the Main Terminal by stopping by Brooks Brothers, or enjoy the iconic leather merchandise from House of Harley-Davidson. Pick up interesting local headlines and regional gifts from Third Ward News in concourse C, or compare with the competition of Skyline News Milwaukee right across the way. Make sure your trip runs quietly by picking up a set of noise-cancelling headphones from InMotion Entertainment (Concourse D), or walk over to Best Buy Express in the same area for a quick pick-up. Take advantage of where you are by skipping the fast food and eating local, giving yourself a pick-me-up from Valentine Coffee Roasters in the Main Terminal and topping it off with a classic Milwaukee burger from Northpoint next-door. If you find yourself craving a homestyle dinner in Concourse C, sit down at French Meadow Bakery & Cafe for soups, salads, and a slew of vegetarian options. Another great place to try a slice of love is Pizzeria Piccola, a local Italian eatery famous for its wood-burned pies. And don’t forget to try a famous Wisconsin sausage at Usinger’s (Concourse D) before you leave.